NCS Regulatory Compliance is the nation’s premier regulatory compliance consulting firm and offers the deep investment adviser and broker-dealer expertise that makes the critical difference to our clients. The have garnered industry respect from both clients and regulators by providing over 25 years of high quality and knowledgeable compliance consulting to thousands of firms throughout the country. Their knowledgeable consultants work closely with you providing dedicated support to assess your compliance needs and develop a proactive strategy that is effective and easy to implement, while anticipating and planning for regulatory changes. NCS Regulatory Compliance will help you avoid compliance issues, giving you peace of mind and the opportunity to focus on your core competencies. 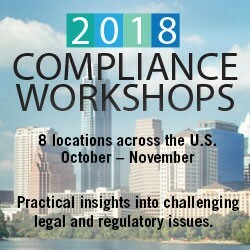 Their services include Registration Solutions, Mock Examinations and Testing, Regulatory Exam Assurance, Ongoing Compliance Programs, CCO Assistance and Training Programs, Regulatory Accounting and FINOP Support, Customized Compliance Manuals, Technology Solutions, Advertising and Website Review, and Cybersecurity Assessments. For more information, visit https://www.ncsregcomp.com/. If you find it necessary to cancel your workshop registration, IAA will refund your registration fee (less $50 administration fee) if you inform us on or before October 4. No refunds will be made after that point. There will be no refund for “no shows.” Notice of cancellation must be received in writing at iaaevents@investmentadviser.org. Substitutions may be made at any time at no additional fee. Please let us know if you have any questions regarding the administrative policies by contacting the IAA office at (202) 293-4222. CLE accreditation is pending in CA, GA, NY, and TX.